Berlin is the city of music, but not only techno concert can be visited in Berlin, I also love to introduce you to some other concerts in this beautiful town. Pick your favourite spot in the midst of the orchestra! 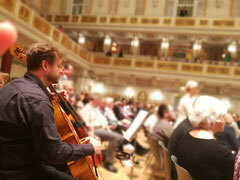 For the concert Mittendrin the musicians of the Konzerthaus orchester will rearrange themselves for you. The title of the concert means “Right in the Middle” and should be taken literally. You can simply find a seat in the midst of the orchestra. In this way you can experience music within your grasp and feel the very special atmosphere that arises between the orchestral members and principal conductor while playing. In the end you also have the opportunity to ask the conductor Iván Fischer questions. While this concert you can be right in the thick of things, not just on the sidelines! Classical music meets boogie woogie, jazz and pop music. That this concept works very well has already been successfully proven in 2017 by the "keyboard flitzer" Joja Wendt, the "world champion" in boogie woogie Axel Zwingenberger, the jazz and ECHO prize winner Martin Tingvall and the classical pianist Sebastian Knauer. I absolutely enjoyed the concert and can just recommend to go! This is a summer special with the Deep House Yoga crew for all electronic music lovers. They combine traditional yoga with the spirit of deep house music to create a unique experience to get energy and relief stress. Check schedule online. 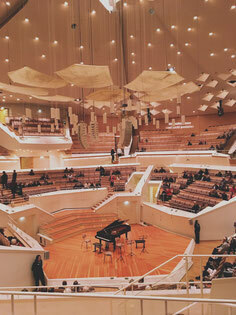 Another established city landmark is the bright Berlin Philharmonic concert hall. Every Tuesday at 13:00 they offer a Lunch Concert for free, no registration needed. 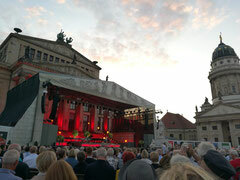 The Berliner KammerOrchester plays every year in February under the conduct of Roland Mell in the Charlottenburger Schloss. A blower's quintet, a prank quartet, a violine duet and trios are playing in different rooms of the castle: the white hall, in the golden gallery, in the dining room, in the winter chamber and in the blue atlas chamber. Beforehand you receive a program, in which the venues, the ensembles and the musical works are listed. 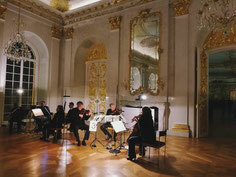 While the concert you are allowed to walk through the rooms of the castle and to the musicians playing classic music. At the end everyone is gathering in the white hall again where all the musicians play together a final musical piece. If you want to find more hidden gems of Berlin, check out my folding maps BertaBerlin, QueerBerlin, BeautyBerlin, YogaBerlin, BeerBerlin and GDR Berlin map. They are available in well-chosen locations all over Berlin and online. But for those of you, who want to stay up to date, feel free to follow me on INSTAGRAM, FACEBOOK or register for my NEWSLETTER BertaNews.